The EG350 is a heavy-duty edger that can successfully produce edged boards from larger timbers up to 100mm thick and maximise the productivity of your sawmill. Powered in-feed and out-feed belts move boards through the edger. The moveable control console includes a variable feed knob to adjust the feed rate from 0 up to 20m per minute, depending on the size of the boards being edged. The EG350 is supplied with two circular sawblades that move in and out from the centre. 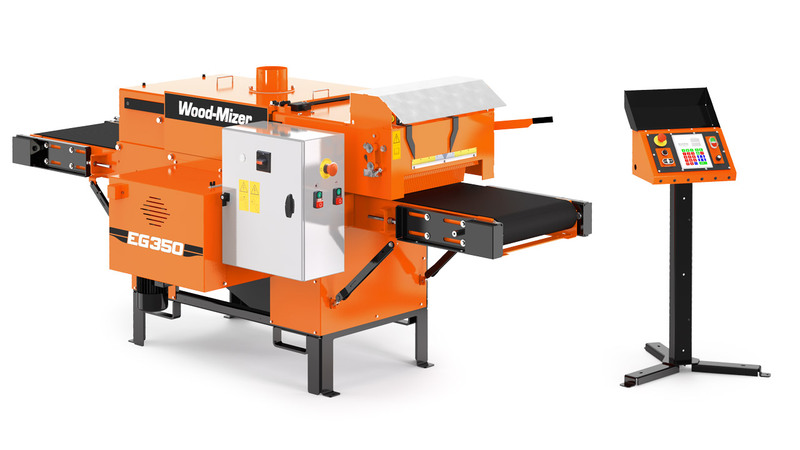 Each 400mm cutting blade is powered individually by an 8 kW electric motor – providing lots of power for quickly processing thick hardwood slabs into finished boards. Two 450mm blades move in and out from the centre of the machine. Quickly and precisely positions the blades for the correct board size. 2 x 8kW electric motors, one for each blade. Assist the operator in accurately positioning the material for maximum recovery. Two steel top rollers and in-feed and out-feed belts move boards through the edger. Upper and lower sawdust outlets allow for comprehensive sawdust extraction.